BlogCatalog, a social network for bloggers which claims a membership of over 100,000 bloggers will partner with SezWho to provide for comment tracking and ranking platform for bloggers. This sounds like something new and will be good news for those bloggers who post useful comments, which I suppose will include their own blogs as well as others. BlogCatalog also mentioned a network which offers a searchable directory to connect bloggers with a wider audience and provides a support group for discussion and collective action. This is another useful feature for bloggers, but it remain to be seen how useful when it is launched. Meanwhile, I am sure many bloggers are looking forward eagerly to see how it works. A blogger, by joining blogger joins BlogCatalog, they will be able to create a personal profile for the network and this means additional exposure for bloggers who want exposure. Not only that, you can create an avatar for the profile and get a listing in the blog directory. 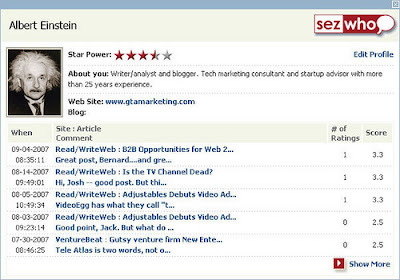 Partnership with SezWho have now given BlogCatalog members to download a plug-in for their blog. However, I cannot comment on how this plug-in works or how useful it can be as it will only be released after the launch (31st January 2008?). With this Comment Ranking Platform, bloggers can provide comment ratings, comment filtering and the ability to view a contributor's commentary across the web. That can either be welcomed by bloggers who wants greater exposure but may be viewed as a sort of invasion of privacy by those bloggers who like to stay private. But it looks like it can help drive traffic to one's blog for those who look forward to getting more visitors to their blog.